This is an amazing second row beach home with 2 units. Both units can be rented together for a total of 6 bedrooms, 3 full bathrooms and 2 half bathrooms, or they can be rented separately. This listing (Iron Seahorse 2) is for the upstairs unit which has 4 bedrooms, 2 full bathrooms, 2 half bathrooms, 2 full kitchens, 2 laundry areas, and 2 living rooms! Perfect for 2 families, or a family with lots of kids! This home has great ocean views, a full roof top deck, covered front porch with rocking chairs, side deck, tons of parking, and even a picnic area with four picnic table and 2 gas grills in the backyard. The backyard or rooftop deck is perfect for throwing corn hole or relaxing after a day at the beach. 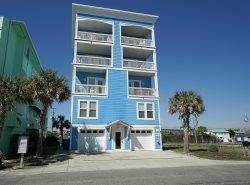 This home has very easy access to the beach, as the public beach access is located just across the street and three homes over. Iron Seahorse has just been beautifully renovated and has new furniture and decor. If you are looking for a comfortable house with tons of space and lots of living options / arrangements, this is it. Extremely knowledgeable, friendly, and quick responses to emails etc. On behalf of my family and myself we would like to thank you for providing us with a perfect place to enjoy our annual sibling beach vacation! For some of my family the beach is a rare experience. They loved escaping the frigid temperatures of the North and walking the beach and taking in all the rays! I got to celebrate a milestone birthday with my family. It was perfect, just perfect! The only thing I would change is slowing down the clock a bit. We are going to the Outer Banks next year to explore the birds, so you have one year to snag us a place! Your team was wonderful and easy to work with. They communicated constantly throughout the process and checked in on us often. We enjoyed the house and the fully stocked kitchen and bathrooms. Very clean and well maintained.